With many of the regular Tuesday night divers recovering from the weekend trip to Mull, numbers were down for this Tuesdays dive. In the end 7 turned up to be greeted by a smooth sea and slack water! In view of the smaller group, the decision was made to dive the wreck of the Ethel Taylor, apparently an intact fishing boat not far out from the entrance of the Tyne . Dropping down the shotline it evident that visibility was looking very promising and indeed at 10 metres the deck of this small wreck loomed out of the gloom. 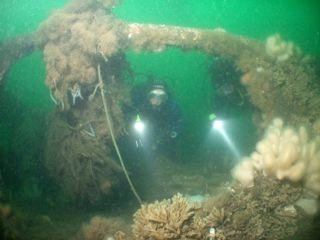 However, immediately on reaching the wreck it was very evident that this was actually the wreck of the steam tug Hercules, a popular club dive back in the 1990’s. The Hercules was sunk on the 22nd November 1940 after she struck a mine whilst towing a barge back to the Tyne . Only one of her crew of 6 apparently survived the explosion and the vessels sinking. Today she sits on the bottom in around 23 metres of water, her hull still remarkably intact although most of her superstructure has long since gone, and almost certainly swept clear given her relative close proximity to the Tyne harbour entrance. 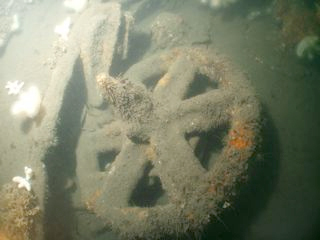 Her propeller is still in place, and for the visiting diver rising upwards over her stern it is then possible to drop back down inside the hull through the gaps between the steel girders that must have once supported her wooden decks. In the middle of the wreck is the large steam boiler and engine. Moving forward you soon encounter the bow. This wreck is notable for the shoals of Dab that swim around the wreck. The tidal currents have also ensured that she has a rich covering of marine life. 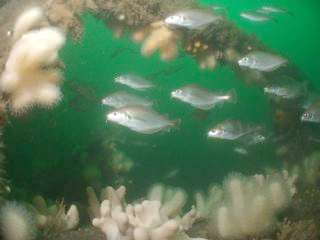 The wreck is clearly popular with fisherman, as there is lots of line and hooks caught up on the wreckage. Indeed at least two of the group found themselves caught up in lost fishing line. The relative shallow depth of this wreck ensures that there is plenty of time to explore this little wreck. The real joy of diving this wreck however, aside from the plentiful marine life, is that the Hercules is still very recognisable as a ship albeit a little one. 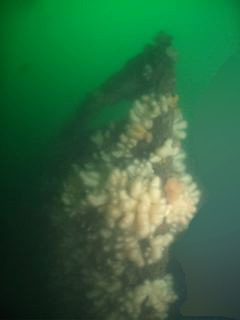 The majority of the wrecks off the Tyne in shallower water tend to be much more broken up and dispersed across the seabed. 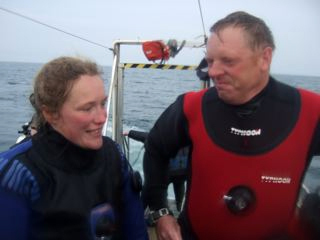 Another pleasant Tuesday evening dive was had by all.